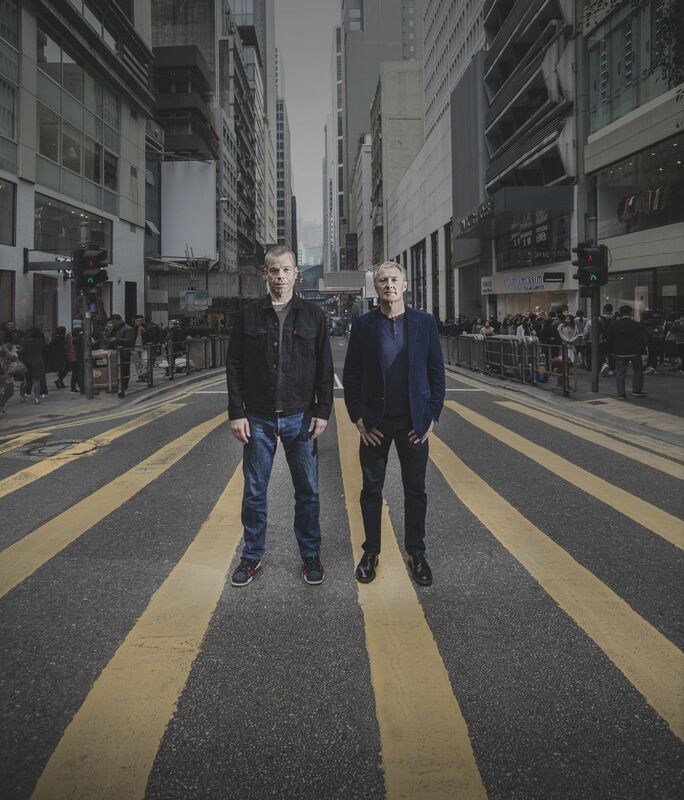 On the count of three, David Zwirner and Wolfgang Tillmans rush into the middle of Queen’s Road Central, dodging pedestrians and gamely pulling poses for Hong Kong Tatler’s photographers. The lights turn green, a taxi beeps and the two men dart back to safety. The scene repeats itself two, three, four times. Between takes, Zwirner and Tillmans—respectively, the world’s most influential gallerist and one of its most famous photographers—chat in rapid-fire German. They have a lot to catch up on. When the stars finally aligned and Tillmans signed up to be represented by Zwirner, he joined a starry roster of more than 40 leading artists, including Yayoi Kusama and Jeff Koons. “Wolfgang is one of the defining artists of his generation and those are the people I want to work with,” Zwirner explains. But even in such distinguished company, Zwirner believes Tillmans stands out. “I think it’s fair to say that right now, at this moment of time in our gallery, there’s no other artist who has a broader audience than Wolfgang,” he says. For Tillmans, the appeal of working with Zwirner extends beyond the obvious attraction that the gallerist is regularly ranked as the world’s most influential art dealer, famous for hosting museum-quality exhibitions in his galleries in New York, London and the recently opened Hong Kong premises. What most drew Tillmans to Zwirner was the latter’s desire to help him realise large, difficult projects. Several successful collaborations followed. In 2015, Zwirner staged an exhibition of more than 100 photographs by Tillmans in one of his New York galleries, and the photographer began regularly donating prints to charity exhibitions hosted by the gallerist. And now, in 2018, the duo are working on what might be their most ambitious project yet. Zwirner opened his first exhibition space in Asia in January, a 10,000-square-foot gallery in Hong Kong’s H Queen’s tower. The inaugural show was an exhibition of new paintings by Belgian artist Michaël Borremans, but Zwirner has reserved the second exhibition for Tillmans. As the show opens this month and coincides with Art Basel in Hong Kong, it has the most coveted slot on any Hong Kong gallery’s calendar. “I love the inclusiveness of Wolfgang’s work and I love the range of people that he touches, so I feel that it will be an incredible second show,” Zwirner says. Many art critics also use the word “inclusiveness” to describe Tillmans’ work, partly because he photographs such a wide range of subjects. Tillmans shot to fame in the early 1990s with his casual portraits of euphoric clubbers at raves around Europe, but has since turned his lens to landscapes, still life, cityscapes and the moon, among many other subjects. In the early 2000s, he also began creating totally abstract pictures that look as if a pot of ink has been poured over a sheet of photo paper. Then there’s the way Tillmans presents his photographs. In galleries and museums, he likes to exhibit his images unframed, either taped to the wall or pinned with bulldog clips in much the same way Polaroid snaps might be casually hung in a home. Since the beginning of his career, he’s also regularly contributed photographs to magazines such as i-D and Vice. This closeness to the media initially caused anxiety among some gallerists, who doubted whether collectors or museums would be interested in a photographer whose images were published in indie magazines. But Tillmans has proved the doubters wrong. His work has now been exhibited at leading museums around the world—he remains the only artist in history to have been given solo shows at both Tate Britain and Tate Modern—and several of his photographs have sold for hundreds of thousands of US dollars at auction. Aside from the fact that Tillmans’ photographs clearly resonate with everyone from teenagers to billionaire art collectors, there was another reason Zwirner wanted to show Tillmans in Hong Kong this month. “Wolfgang is a political artist, he looks at issues. We want to bring art to Hong Kong that people talk about, and I cannot imagine that people will not speak about his exhibition,” he says. “Political artist” is one way to describe Tillmans; another is “activist.” Tillmans’ work became expressly political in mid-2016 when he released a series of posters encouraging Britons to vote to remain in the European Union. As a German who was splitting his time between London and Berlin, Tillmans felt the prospect of Brexit put his whole future at stake. Tillmans has done such extensive research into politics over the past couple of years that he will soon release a book called What Is Different? exploring the rise of right-wing populism in the West. For the book, he interviewed seven leading thinkers around the world, including politician Wolfgang Schäuble, who is president of the Bundestag, Germany’s federal parliament, Australian psychologist Stephan Lewandowsky, and British journalist Lionel Barber, the editor of the Financial Times. These lengthy interviews are interspersed with collages of Tillmans’ photos. “It’s a reader [rather than a photobook] and I’m actually quite proud of it,” Tillmans says sheepishly. Although Tillmans’ interest in politics shows no sign of waning, he never distances himself from his early photographs documenting the acid house and techno scenes in nightclubs across Europe. “I still go out, I still love music, I still go clubbing,” he says. Tillmans’ love of nightlife has taken another turn over the past couple of years, as he’s begun releasing music. He has written and recorded songs on and off since he was a teenager but kept his efforts mostly private until 2016, when he released an EP, a half-hour-long visual album and a track called Device Control. The latter received international attention after Grammy Award-winning singer Frank Ocean included it in Endless, a video album he also released in 2016. This move into music has seeped into Tillmans’ art. Rather than just photographing musicians and clubbers, he has brought music itself into exhibition spaces normally reserved for fine art. He performed several of his songs in Tate Modern’s basement South Tank space and has also included a “playback room,” a booth that allows visitors to listen to music at the highest possible quality, in several of his shows. Like most of his exhibitions, Tillmans’ Hong Kong show will feature a variety of subjects. “There are new still lifes, two big maritime landscapes and a gigantic picture of the Sahara Desert, which I’m really excited about,” Tillmans reveals. There will also be a selection of portraits, including some taken last year during a total solar eclipse in Illinois in the US and others taken more recently in Kinshasa, the capital of the Democratic Republic of the Congo.